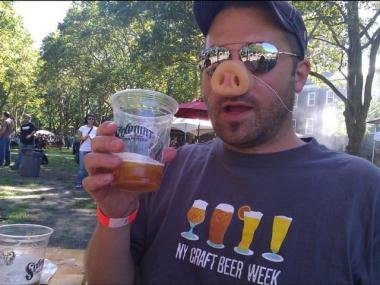 Beer connoisseurs drank plenty of beer at last year's Pig Island event hosted by Food Karma Projects. But attendees of the 2011 Brewers' Pic Nyc said the event was poorly organized. GOVERNORS ISLAND — Beer connoisseurs had to wait an extra hour Sunday to get a sip of brew at the first annual Brewers' Pic Nyc, despite having purchased VIP entrance to the festival, which promised early admission, food and drinks at 11 a.m. According to Gothamist, organizers of the street food, craft beer and music festival held back on the libations before noon on Sunday because of confusion surrounding New York State's notorious blue laws, which regulates the purchase of alcohol. New York's blue laws were in fact changed in 2006, making it legal to sell alcohol after 8 a.m. on Sundays. Making matters worse, some VIP attendees complained they were not able to cut lines for beer and food as the premier-priced $85 tickets originally advertised. Regularly priced tickets went for between $15 and $45. "We were promised shorter VIP food & beer lines w/ VIP tix for #brewerspicnyc. They lied. This is practically extortion," tweeted brewdroid. Event-goers also sounded off on Twitter and Facebook about the general disorganized nature of the event, which was sponsored by Food Karma Projects, the same group that put on last year’s Pig Island, Meatopia 2010 and Brewers 4 Brewers on the island. "EVENT ORGANIZERS! GET YOUR ACT TOGETHER! Bad organizer, bad organizer...no donuts for you!" wrote Facebook user Leftonred 'Lefty' Atanycorner. Food Karma Projects organizers said they recognized that the event had been mishandled on Sunday and urged attendees to return to the second day of the event, which will run until 5 p.m.
"Hi guys, we are out at govs island for day 2 of Brewers Pic Nyc and want to be sure you all know that we hear your concerns and have added more beer and more food today. Come on down and join us!," the organizers wrote on their Facebook page. As of Monday morning, no problems were reported on the event’s Facebook page of on Twitter. "So far, #brewerspicnyc is looking good today. No issues like those reported yesterday," wrote Peter MacKellar on his feed.